Dec 10th March condoms, today he was made to wear one!! PMBComment | Developments in Russia are still on track with my succinct - and for many shocking - prediction: a Christmas without Putin (keep in mind that Orthodox Christmas falls on January 7th). The size, tone and wide-ranging nature of the speakers at today's rally (see NYTimes report below) cannot be compared to anything Russia has experienced since the fall of Communism. A mere 3 weeks ago, when I last arrived in Moscow, nobody would have been able to predict that Winter would be a good time to ignite a Russian Spring. But that is exactly what is happening and 120,000 people on the street of Moscow in sub-zero temperature is the equivalent of X more in cushier Western capitals or warmer Middle Eastern conditions. The dismantling of Putin's power base will be much harder than dislodging the spent Soviet nomenklatura. The new power elite is awash in cash (and shares) and probably fears reprisal even more than the old apparatchiks. But, on the other hand, they are awash in cash (and shares) and might behave very opportunistically and be all too happy to dump Putin - and his inner circle of "thieves and scoundrels" - as long as those giving them the final push can hold on to some (or maybe all) of their goodies and morph into born-again democrats and liberals. MOSCOW — Tens of thousands of citizens converged in Moscow on Saturday for the second huge antigovernment demonstration in a month, an early victory for activists struggling to forge a burst of energy into a political force capable of challenging Vladimir V. Putin’s power. The first such demonstration, two weeks ago, was unprecedented for Mr. Putin’s rule, and there were reasons Saturday’s turnout could have been lower — among them, winter holidays and the onset of bitter cold. If the movement sustains its intensity, it could alter the course of the presidential election in March, when Mr. Putin plans to extend his stretch as the country’s dominant figure to an eventual 18 years. Opposition voters were furious over the conduct of this month’s parliamentary election, and will be roused again by Mr. Putin’s campaigning. Still, maintaining momentum is a huge challenge, and the initial giddy mood has already hardened into something more serious. The crime novelist Boris Akunin, peering out through wire-rimmed glasses as he addressed the crowd from a stage, said demonstrators should prepare themselves for a long haul. The protests have rattled the Kremlin, which has not encountered widespread political resistance for a decade. 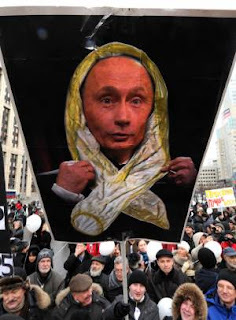 Mr. Putin initially sneered at the demonstrators, saying days after the first rally that the white ribbons they have adopted as a symbol resembled limp condoms, and that they participated only because they were paid by foreign agents seeking to undermine Russia. But it is clear that government elites are taking protesters’ complaints as a warning and scrambling to head off a more dangerous confrontation. On Saturday, for the first time, two high-level figures connected to the Kremlin were at the demonstration. Former Finance Minister Aleksei L. Kudrin, a member of Mr. Putin’s inner circle for more than two decades, took the stage to express his support for many of the protesters’ demands: the dismissal of the head of the Central Election Commission, Vladimir Y. Churov; the dissolution of Parliament and new elections; and changes in the election code to allow for free competition. Mr. Kudrin published an article on Saturday in Kommersant, a respected daily newspaper, noting that many employees of state enterprises were participating in the demonstrations. The billionaire Mikhail D. Prokhorov, who has said he will run against Mr. Putin, was also in the crowd, though he did not deliver a speech. He arrived without a security detail, stooping occasionally to answer questions and pose for photographs with young women. Both Mr. Kudrin and Mr. Prokhorov are viewed skeptically by a portion of the protesters, who fear they represent attempts by the Kremlin to dilute or divide a powerful new protest electorate. “Sorry, what relationship does Kudrin have to democratic movements?” wrote Vladimir Varfolomeyev, an editor at the radio station Ekho Moskvy, via Twitter. “He’s a bureaucrat who has faithfully served the regime for 10 years.” When Mr. Kudrin took the stage, he was booed by some in the crowd and cheered by others. Though all demonstrators interviewed said they were hoping to avoid a violent uprising, some left the possibility hanging in the air like a warning. Aleksei Navalny, the blogger whose enormous popularity set these protests in motion, was greeted with a deafening roar from the crowd, which had been begging to see him for more than an hour. He added: “These days, with the help of the zombie-box, they are trying to prove to us that they are big and scary beasts. But we know who they are. Little sneaky jackals! Is that right?” The crowd roared. “Is that true or not?” Another roar. For organizers, the challenge is to keep the movement alive at all, since the protesters are working people who will leave the city for two soporific weeks in January. Their commitment to politics is unclear; some say that they are willing to demonstrate for years, others that they will lose interest if a leader does not emerge. “My family thinks that Grandma has gone crazy,” she said. Glenn Kates, Ilya Mouzykantskii and Nikolai Khalip contributed reporting.